Pain ,waking up groggy, lack of motivation and over weight are my major symptoms . The pain in my left leg and hip are so bad at times I can’t even move! Is there help anywhere for this horrible pain? Was diagnosed with Hashimoto’s after my son was born in 1996 at the age of 21. I’m now 43 and was told my my prescribing doctor I can only take Synthroid due to the grave nature of my values at diagnosis (T4 in the 50s). I struggle mostly with the LDL cholesterol being high in the last few years. I lost 20lbs, completely changed my diet, but to no avail. It’s frustrating because my diet is excellent and I work out 6 days per week for an hour or more at a time and still LDL keeps going up. Other weird symptoms for me are heart palpitations, dizziness upon standing (low blood pressure drops) and Raynaud’s syndrome. I also have wonky reactions to immune mediated drugs like steroids. I avoid them like the plague. 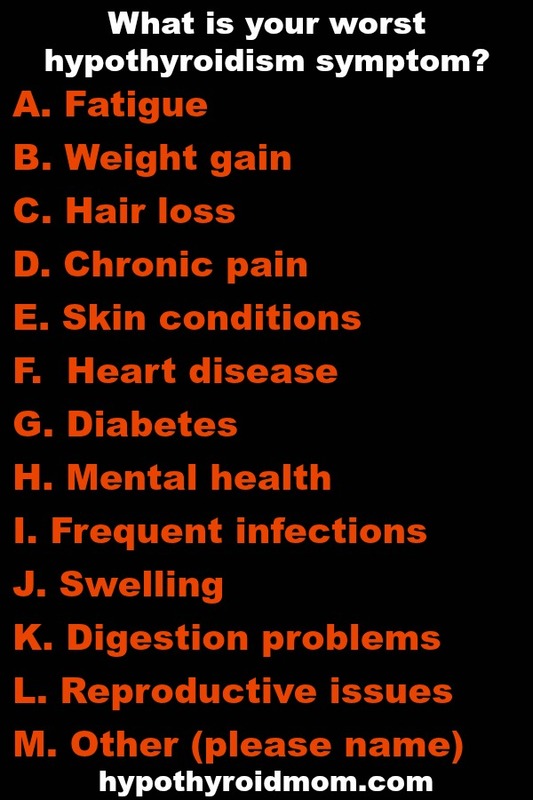 Though my condition is “well managed” clinically speaking, I still have these symptoms. I wish my husband could understand what I truly go through on a daily basis. Not only am I recovering from my second back surgery in a year, I’m dealing with a lot of the side effects of hypothyroidism. I’m in constant pain in my back and leg, I have carpal tunnel, losing my hair, dealing with extreme fatigue, weight challenges, skin issues and countless other symptoms. Yet, as a mom of 5, I don’t have time to deal with all of these issues, I just have to get through the day. If my husband could understand what I’m truly going through and how much pain I’m in on a daily basis, maybe he could help me more. I would love to find a support group that we could attend so he could understand. It’s such a frustrating disease. Having side effects that aren’t “listed” by mfg is frustrating. I get a rash all over my neck on synthroid..but am told it’s not from that. Happened twice. No more of that med. After 9 years of fog my endo added T3. Fog went away in fee hours. MAGIC! I’m super sensitive to meds so started with 5mg. All of my bones hurt. Am told that isnt a side effect. Cur them in half and that went away. I had to chuckle at the sighing comment. I do that a lot when I have fatigue. Tinnitus is my first symptom of being out of range. Thanks for your page. It’s nice not being alone. Tongue swelling,Burning Mouth Syndrome. Just had one flare this weekend so bad it caused my taste buds on the very back of my tongue and the 2 big ones on the throat to literally pop up, Drug sensitivities and Sensory Overload. I was diagnosed with graves in 06.. from 06 to 2018 I took levo and altho I definitely had symptoms, I was able to live a normal life.. I came off meds for a few months due to no insurance.. now if been back on for 3 months and I can’t function at work or even as a mother.. heart palpitations and chest hurting and hair falling out .. gained 20 pounds in 2 months… completely out of breath ..even right when I wake up.. iv cut my levo in half ..on my own.. I take a thyroid supplement also that my gp did approve.. I take vitamins daily.. I’m now starting to watch my gluten.. I’ll literally try anything at this point to feel better.. I’m 36 with 3 kids or teens actually and a full time job.. my husband ..there father passed away 4 years ago.. I really just got my life back together from that and now I cant even enjoy it.. I’ll take any advice..
I’m constantly being told my blood work is fine. I finally saw my results for myself and found low T3. But apparently that’s not considered a problem. I have many of the symptoms but can’t find a doctor that believes me. Have your doctor run a TPO test. It’s a blood test that will show if you have high antibodies. High thyroid antibodies is usually concurrent with hashimoto’s. They can be elevated even if your TSH levels are normal. 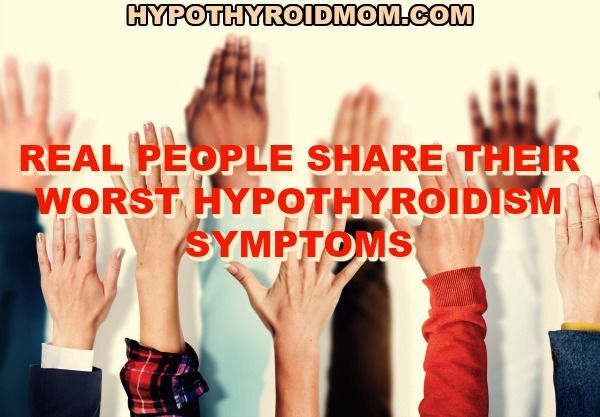 I went many years misdiagnosed for 9 years I was told I just had hypothyroidism and levothyroxine (sy nthroid) was the magic pill and I would feel so much better. My Dr obviously didn’t have hashimoto’s nor hypothyroidism. I went on all that time accepting that was life. I wish you the best. Be your own advocate, you know YOU better than anyone. I was constantly told my bloods were fine but I knew my body. Not only had I gained almost 10 stone in 2 years, I was freezing, falling asleep, losing hair, brittle nails, memory problems, aches and pain etc. I literally begged my GP to send me to an endocrinologist as I was only being treated with levothyroxine. He did and for the last 2 years I’ve been on a combination of levothyroxine and liothyronine and since Jan 2017 have lost just over 9 stone in weight. 1 stone left to lose. Had bloods done a few weeks ago as fatigue and pain was returning and it turned out the levothyroxine was too high so it’s been reduced and liothyronine not touched. I think I’m starting to feel a bit better again, more bloods in 4 weeks time. Push for referral to endocrinologist good luck. Is T3 a Rx med or something OTC? I covet the stories of getting this later in life. I have been treated for this since age 11 and I am 38. I’m with you on this one – I was diagnosed at a similar age after being under the children’s hospital for joint pains all my life. They decided my joint pains must be part of the thyroid issue and hence treatment began with levothyroxine. I’m now 37 – and don’t feel like I’ve felt fully human a single day in my life. Since then my joint pains I now know are caused by hypermobility syndrome, I’ve developed ibs, diabetes type 2, I’m so tired all of the time, I get brain fog, random swelling in my hands and arms from time to time. Yet my levels are surprisingly stable on 150mg levorthyroxine daily.